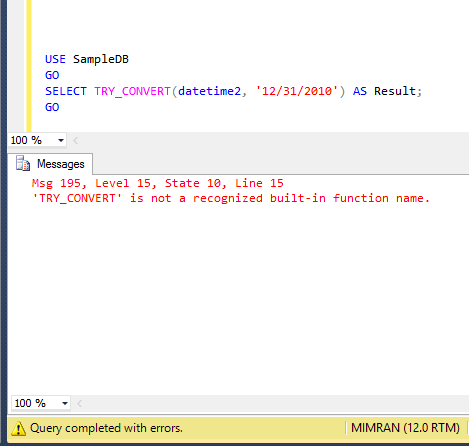 SQL SERVER – Fix – Error :195 – ‘TRY_CONVERT’ is not a recognized built-in function name. 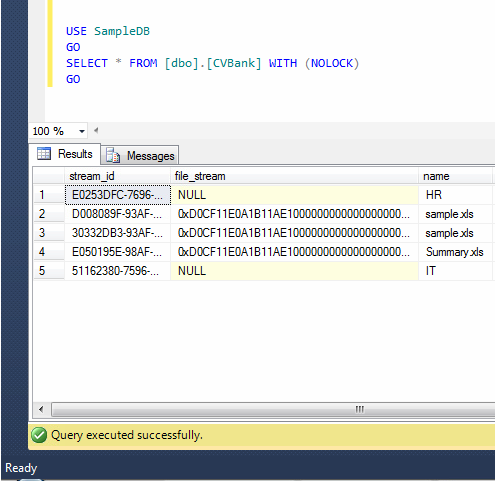 TRY_CONVERT is one of the new conversion functions shipped with SQL Server. This function converts expression from one data type to another data type. The beauty of this function is that if it fails to convert, it returns NULL value as a results and due to this functionality, it has an edge over CONVERT function. 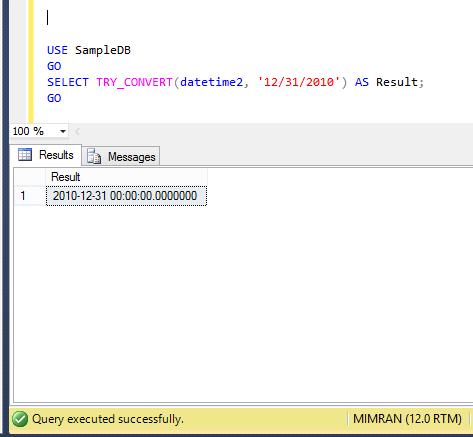 I started using this function wherever conversion required since SQL Server 2012, however, I received an error message this morning when I was trying to use TRY_CONVERT function in SQL Server 2014 as shown below. Error Message: ‘TRY_Convert’ is not a recognized built-in function name. Let me create a sample using TRY_Convert function to demonstrate this error. ‘TRY_CONVERT’ is not a recognized built-in function name. 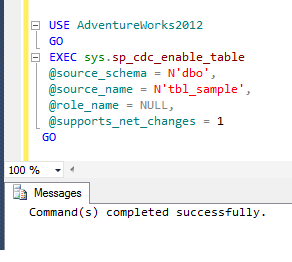 Ooopps…… I am unable to use TRY_CONVERT even though I am using SQL Server 2014 as shown above. The resolution is very simple, actually, what you are trying to do is to use TRY_CONVERT function in one of the databases having compatibility less than 110 even though you are using SQL Server 2014. Lets fix this issue step by step. As you can see above the compatibility of the database is below 110, lets change it to enjoy the core functionality of SQL Server 2014. Note : Test the compatibility change of your database on your test/development database first, before proceeding to production database. Remember, whenever you use NEW SQL Server functions that are compatible with specific versions / compatibility level, you MUST check the version/ compatibility before implementing those functions. 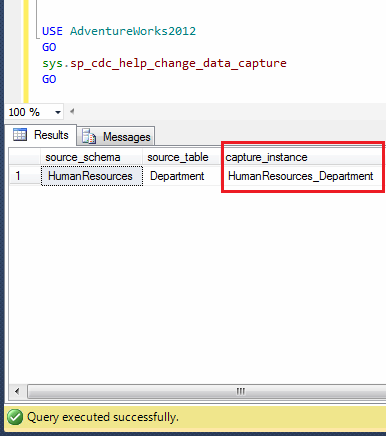 Columnstore index is one of the new features shipped with SQL Server 2012. I have written few articles about this type of index and described how it boosts in the performance. 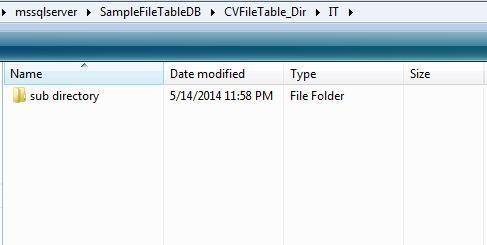 Recently, I worked on a huge table having table partitions residing in different file groups. And it seems that it is already optimized using Table partition. However, I tried to create a columnstore Index to further boost its performance and I did succeed. Let me demonstrate it step by step. First of all, you need to create a partition function as shown below. If you already have partition function please SKIP this step. Secondly, you need to create a partition scheme on the above partition function as shown below. If you already have partition scheme please SKIP this step. Now, it is time to create a table using above created partition scheme to partition the data accordingly as shown below. If you already created a table using partition scheme please SKIP this step. Lets insert some data to test the performance. --This query may take 2 to 10 minutes depends upon the server. Once you insert the data, lets build the columnstore index. 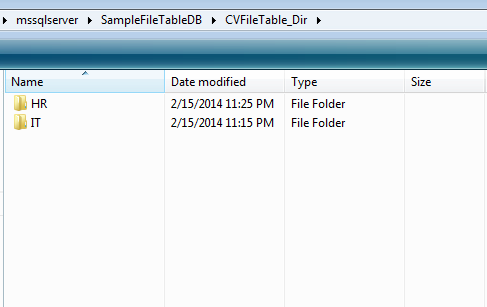 Remember, once you build the columnstore index you cannot modify the data in the table. Once you build the columnstore index, lets execute the query and view the result set WITHOUT columnstore index. --and will return the result set. CPU time = 15 ms, elapsed time = 69 ms.
Table ‘PurchaseOrderDetail_Sample’. Scan count 3, logical reads 4100, physical reads 0, read-ahead reads 0, lob logical reads 0, lob physical reads 0, lob read-ahead reads 0. CPU time = 983 ms, elapsed time = 1158 ms. 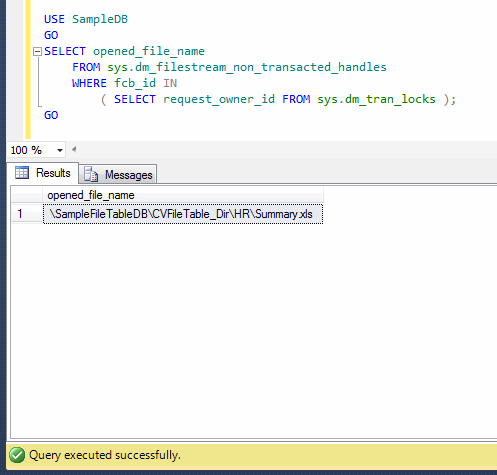 Lets execute the query and view the result set WITH the columnstore index. CPU time = 16 ms, elapsed time = 57 ms.
Table ‘PurchaseOrderDetail_Sample’. Scan count 1, logical reads 242, physical reads 0, read-ahead reads 0, lob logical reads 0, lob physical reads 0, lob read-ahead reads 0. CPU time = 717 ms, elapsed time = 782 ms.
As you can observe, there is huge difference between both queries (with and without columnstore index) performance. However, you need to test it in your scenario and implement it accordingly. In addition, kindly read the restrictions & limitation about columnstore index as well.